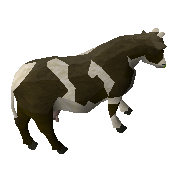 Yanille is a town east of Castle Wars and slightly north of Gu'Tanoth. This town is a prime spot for mages. 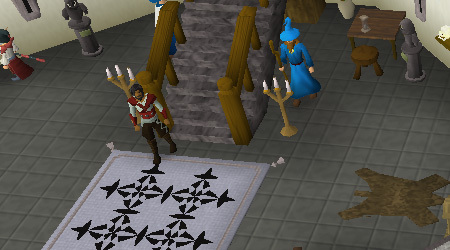 In Yanille, you can start and finish the Watchtower Quest, and with 66 magic enter the Magic Guild. There is also a Hunter shop, bank and so much more for just one little town. Using the Ring of Duelling, teleport to Castle Wars and walk east, past the ogres, entering Yanille at its west gate. After completing the Watchtower Quest, you can teleport to the Watchtower. Climb down the ladders and walk east until you can crawl under the agility shortcut or come to the northeast entrance. Level 58 Magic required. 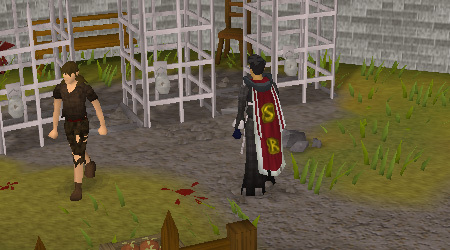 Use the Ardougne Cloak 1 (obtained by completing the easy Task set for Ardougne) to teleport to the Monastery. 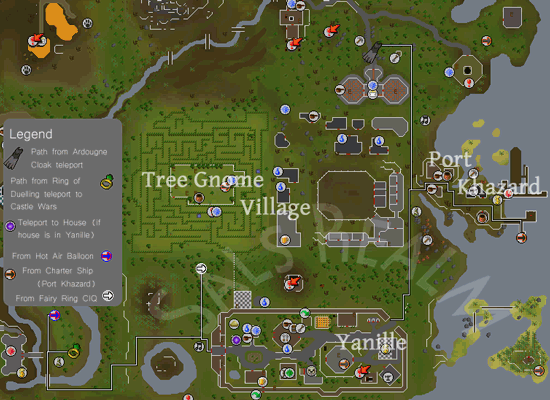 From there, walk south on foot until you reach Yanille's eastern entrance. Travel from the spirit tree in the Tree Gnome Village and exit the maze from the entrance. 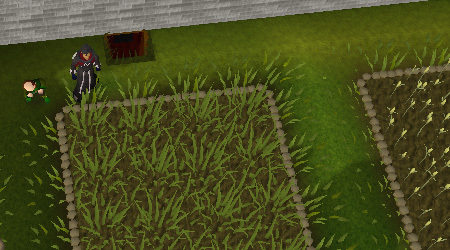 Walk south from the maze entrance until you reach Yanille's west gate. 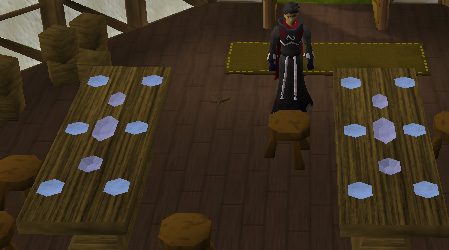 This requires completion of the Tree Gnome Village Quest and the Grand Tree Quest. Use the level 40 magic level, Teleport to House. 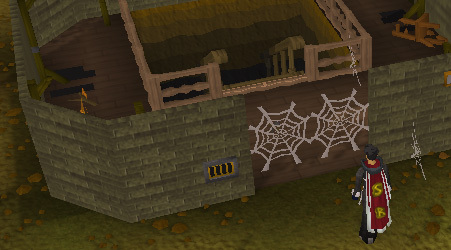 This will only be useful if you have your house in Yanille. Once you arrive in your house, use the exit portal to arrive in the city. Fairy Ring code CIQ will get you just northeast of Yanille. A Fairy Tale Part 2: Cure a Queen needs to be started. 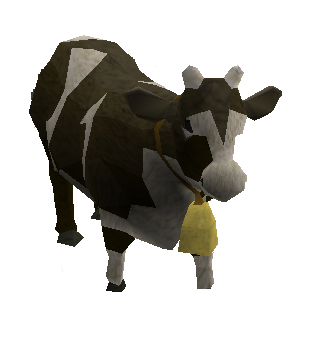 Use the hot air balloon system to travel north of Castle Wars. Head south near Castle Wars then walk east, past the ogres, entering Yanille at its west gate. Completion of Enlightened Journey is required. 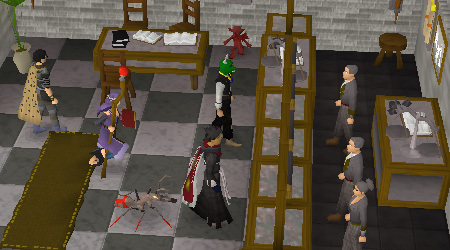 A typical bank where people buy, sell and chat to other players is located to the far east of Yanille. 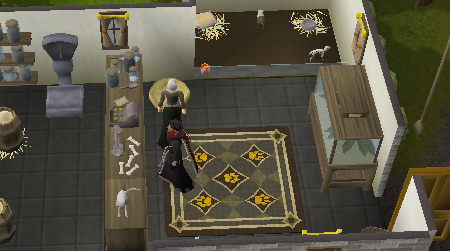 Three anvils are in a house just south of the bank. 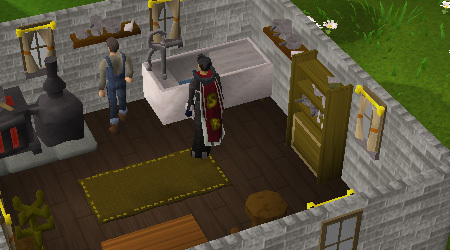 This makes the anvils a good place for people who want to do a lot of smithing and have a lot of metal bars in their banks. 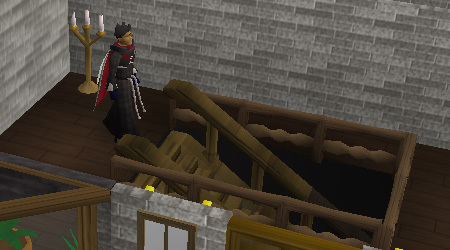 This is an entrance to the Yanille agility dungeon. You will need a lock pick and 82 Thieving to enter this dungeon via this door. The Magic Guild requires 66 Magic to enter. However, if you really need to speak with a wizard inside, you can ring the bell outside and a friendly wizard will assist you. 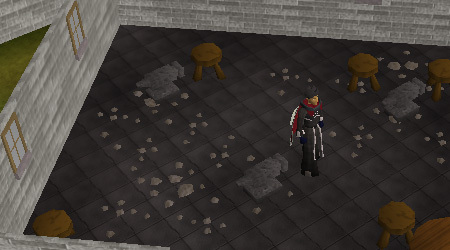 Inside, you can teleport to the rune essence mine and other places where wizards roam. There are also two notable shops located inside the guild on the second floor: a Magic Shop, and a Robe Shop. The Magic Guild's Magic Shop sells a variety of low and high-level runes, as well as battlestaffs and elemental staffs. 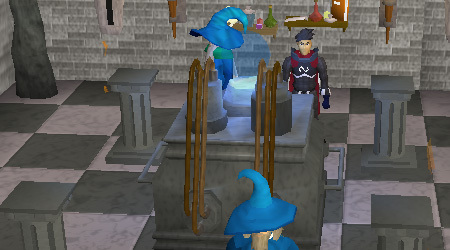 The Magic Guild's Robe Shop sells the full set of blue Mystic Robes. This shop sells a lot of hunting equipment, including teasing sticks and butterfly jars. The man in the red top will also sell you a special crossbow and crossbow ammo, if you have the right materials and a certain amount of cash in your inventory. Home of dragon bitter(2gp) and Greenman's ale(10gp). The bar is also the second home of a rather drunk captain. 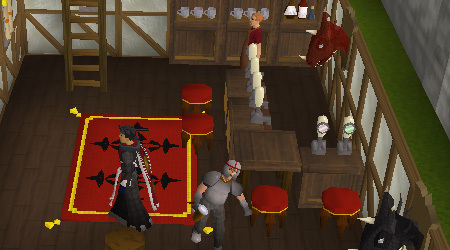 The Dragon Inn is home to the infamous Fire brandy used in the Bar crawl. Want to rest at home, or invite a friend over? 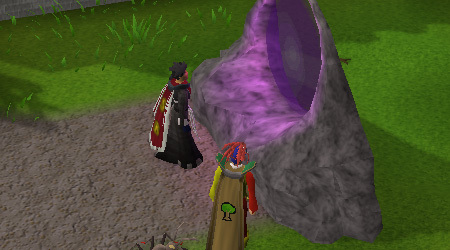 Well, stop by at the POH portal and invite some friends over. This house portal is the closest to a bank, so you might want to consider moving here if you're not already here. A sand box is located just north of the portal. 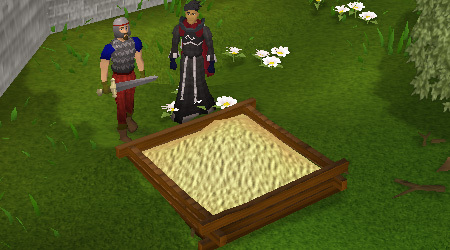 Sand is used a lot in crafting and glass making. How about popping in on Bert? This lovable character is the start point for the Hand in the Sand Quest. Once you have completed that quest, he will store 84 buckets of sand a day in your bank if you ask him. Also, feel free to use his range and sink. If you want to come into the Watchtower, you'll need to complete the Watchtower quest. If you haven't, you'll need to climb up a wall on the tower to reach the top floor. If you befriend the wizards on the top floor, you can use the ladders. If you have level 58 Magic and the ability to cast the Watchtower teleport spell, you'll be able to teleport to the top of the watchtower. Also, the top of the tower is where you can start the Watchtower quest. Are you hungry? With all this exploring, you must be, so why not stop at the restaurant? Frenita sells a variety of cooking items, and there is a convenient range located at the northern end of the building. There is also a water Tap that you can use here as well as a Dairy Churn. Do you have any hop seeds that need growing? Alternatively, do you need some grain? Well, here's the place to be. Also, in the wheat field, watch out for crop circles. Imps love messing around here, and a crop circle sighting will open the portal to play the Activity, Impetuous Impulses. 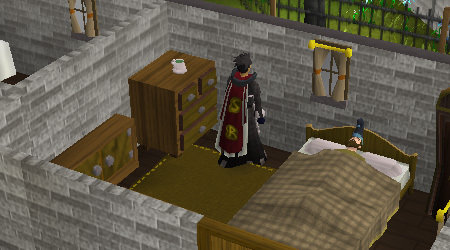 Not much downstairs except a few poofing imps and an old piano but you might be led to this very room by a clue scroll if you're lucky enough to get one. Sithik Ints is feeling a bit under the weather, so it's nice if you visit him. He is used in the Zogre Flesh Eaters Quest. Have the guards caught you putting your grubby fingers where they shouldn't be? Well, if so, you'll end up in jail. If you are placed in jail, you can break out by completing a simple puzzle. If you see someone in jail, you and the nearby tramp can throw rotten tomatoes at the thieves. Rotten tomatoes can be bought from the nearby crate for one coin each. Are you having some trouble getting into the first dungeon entrance? Well, don't worry. This method of entering requires a slashing weapon to cut down the webs. However, be warned that there are poisonous spiders located in this dungeon, so food and anti-poison potions are recommended. 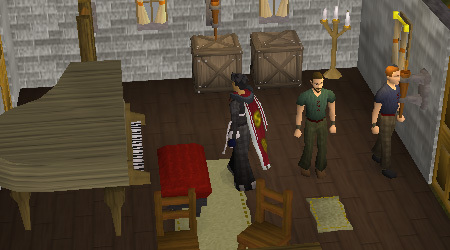 In Yanille, you can meet the locals and chat about current events or just get drunk in the bar.